Spiritual satisfaction! The Apostolic Church in Adjeli, Cameroon is an international Christian church. The foundation of its teachings is the Holy Scripture. It is developed from the Catholic Apostolic Church in 1863 and is led by apostles, just like the first Christian faithful. The Church recognizes three sacraments: Holy Baptism, Holy Sealing, and Holy Communion. Other significant elements are missionary work and love for one’s fellow human being. The Apostolic Church emphasizes the personal accountability of its members for their actions. The Apostolic Church is politically neutral and independent. It is financed by the voluntary donations of its members. Nine million Christians around the world currently profess the apostolic faith. 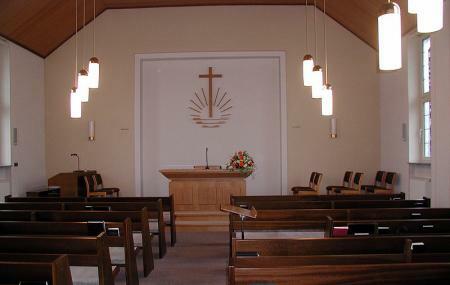 Visiting this Church will bring peace to the heart. Personalize your visit to the city by chalking out a plan using Adjeli trip planner. Choose from variety of exclusive Adjeli vacation packages for your next visit or create own own. Check out the various options for how to reach Adjeli and finish off your vacation package by booking the ideal transfer. Love this? Explore the entire list of places to visit in Adjeli before you plan your trip. Fancy a good night's sleep after a tiring day? Check out where to stay in Adjeli and book an accommodation of your choice.